Last week I watched as the driver of a bus in San Salvador flipped through his collection of CDs, looking for something to play. Every CD was clearly a copy burned on a computer. While he may have ripped those songs on his own computer from legitimate CDs, it is much more likely the he bought those CDs from one of the many street vendors hawking cheap, bootleg copies of CDs and DVDs. This week, the majority of those vendors have closed up shop. As part of the process of implementation of CAFTA, El Salvador passed tough new laws against copyright infringement. CAFTA provisions on intellectual property required El Salvador to increased penalties including criminalizing end user piracy. Now selling pirated software, music and movies in El Salvador carries a mandatory jail sentence. 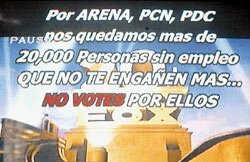 The screen urges viewers to vote against the political parties who voted for the new copyright laws. Yesterday, vendors took to the streets demonstrating against the laws and urging the government to take steps to address the destruction of their livelihoods. El Diario published images of the street protests which included blocking traffic and burning tires. Are there penalties for posession of pirated CDs and DVDs? I am sure the business will continue underground. Will the authorities devote much manpower on this crime, when there are relatively more harmful crimes out there? The vendors disappeared for a few days, but are now reappearing. Some studios now make more off DVD sales for a movie than at the theater. Even with pirated DVD´s being sold. Just how much income will they lose here? The reality is very few will purchase, or can even afford a $25 DVD at the mall. So most of the sales the studios claim to be losing will never be reclaimed. In the meantime, probably hundreds of vendadores of pirated movies will be out of a job if the government laws are enforced. I understand the need for copyright protections, but I also see the need for people here to feed their families. Replying to Eduardo's comment -- I don't think possession alone is criminalized. The penalties are for making pirated copies and selling pirated copies. I agree that there will be an underground market for copies, as is true in many countries. El Salvador will devote the minimum amount of resources necessary to placate the US. Its interesting that we are on opposite sides of this issue, given our usual leanings. Perhaps because I am a lawyer, I see this kind of copyright infringement as theft from the artists and writers (as well as the studios). I can't condone the sales of pirated discs, even though I would have a hard time insisting on heavy penalties. Could there be Salvadoran recording artists who have a hard time being commercially successful because, as soon as they release a CD, it is available from street vendors in pirated form with none of the revenues going back to the artist? What is being ignored here are the benefits to consumers. Let the poor enjoy the same music we do. The enjoyment by consumers who buy pirated CDs, but cannot afford the full-price version is a benefit to mankind that doesn’t cost anyone anything. These benefits far outweigh any potential loss to millionaire recording artists because so few Salvadorians can afford the full-priced version. Tim’s point about the hypothetical Salvadorian recording artist is well taken, but again, the benefits to the masses of consumers vastly outweigh the miniscule potential benefits to musicians. The loss of one hypothetical artistic outlet is a small price to pay for making the life of the poor a little more tolerable. Tim, am I mistaken or have you not opposed the outlaw of “pirated” medicines in the past? What is the fundamental difference here? Sure, it is more important that people can afford medicines than CDs, but the development of medicines tailored to tropical disease is also more important the production of new music. If you accept the concept of intellectual property rights, then I think you have to treat illegal copying as stealing, every bit as much as stealing a loaf of bread. The loaf of bread is also necessary to improve the lives of the poor, but we don't use hunger as a reason to legalize bread-stealing. (Note that this is a much different question than the compassion we have for the bread thief in deciding what is punishment). With respect to medicine, my argument is that CAFTA restricted the ability of governments to decide that compulsory licensing was necessary or to shorten the length of time of patent exclusivity. I believe such powers are important ones for governments to have to deal with public health issues and should not be negotiated away in a multilateral treaty like CAFTA. I don't believe it is inconsistent to say that a government can restrict how a patent holder can use the patent monopoly, while also saying that copyright is an important right, one that nations which want to be part of the modern world economy will enforce. Remember that it is the ability to ask people to pay for what you have created which provides part of the incentive for the creation and wide distribution of works of software, music, drama, literature and more. I think I see how you distinguish between the medicine and the music cases, and you make a reasonable case. In the case of medicine, it is the government expropriating the intellectual property, whereas with music, it is individuals “stealing” the intellectual property while the government looks the other way. I’m not convinced that one is more moral than the other, but I grant you that there is a difference. In either case, the intellectual property exists only because the government grants it. El Salvador has every right to expropriate or allow individuals to “steal” if they are willing to accept the diplomatic consequences. The diplomatic consequences of expropriating medical patents would be exclusion from CAFTA. Refusal to respect artistic copyrights may or may not have similar trade repercussions. Creating an incentive for the creation of medicine, music, etc. is important. I certainly agree that copyrights and patents should be enforced in rich countries. If data shows that enforcing intellectual property rights in poor countries increases these incentives significantly, I could be persuaded to support such enforcement. However, this can’t be resolved with a straightforward moral argument. Stealing music and stealing bread are fundamentally different. Every piece of bread you steal deprives someone else of a piece of bread. Stealing music only deprives the “owner” of a potential customer. Thus, every time someone WHO CAN OR WILL NOT PAY $15 for a CD “steals” music, the world is unambiguously better off. If Wally and I guess correctly that very few Salvadorians will pay Hollywood prices, enforcement of copyrights in El Salvador will do nothing but deprive poor people of musical enjoyment. Good discussion everyone. Good points of view from all sides. A couple of things to consider, it is not necessarily the poor who buy the music. My experience is that most of the customers are “working class” and higher. But even for a factory worker, working 6 days a week, 8, 10 or 12 hours a day, $15 for a CD or DVD or whatever would be about 10 to 15% of their monthly salary. Cost of living is about 20% higher in El Salvador, if you want to live by US standards. God knows it wouldn’t hurt anyone not to see the kind of junk movies pushed off on us now days. And music? No comment. It isn’t right, it is absolutely illegal, it should be stopped. But there have always been black markets when money is over inflated. You will see much more of it, coming to a US city near you, sooner that you probably want to. The economy is going to force many more into the black market before it is over, both as entrepreneurs and as customers. Antes de describir la piratería americana es conveniente explicar las diferencias entre piratas, corsarios, bucaneros y filibusteros, los protagonistas de esta historia. Se suele utilizar estas denominaciones como sinónimos, sin tomar en cuenta que se refieren a personajes diferentes y con diversas motivaciones. De acuerdo con Manuel Lucena, el pirata "era el que robaba por cuenta propia en el mar o en sus zonas ribereñas ... es un enemigo del comercio marítimo en general porque se mueve exclusivamente por su afán de lucro, sin discriminar ningún pabellón nacional". Era, por tanto, un hombre que se situaba al margen del sistema imperante en aquella época. En su mayoría los piratas eran gentes pobres, miserables, delincuentes, vagabundos, desertores o perseguidos por sus ideas. De hecho, "a la piratería se llegaba por necesidad, difícilmente por vocación". Los ingleses John Hawkins y Francis Drake fueron los grandes personajes que señalaron la aparición del corsarismo en la América del siglo XVI. Glorificados por la literatura se constituyeron en símbolos de esta actividad. En síntesis: "Si el pirata era romántico, porque luchaba contra el sistema, el corsario era, en cambio, clásico, porque estaba integrado en el mismo e incluso lo sostenía". Propiamente americanos fueron los bucaneros y los filibusteros. Los primeros aparecieron desde 1623 en partes deshabitadas de La Española, que poseía gran cantidad de ganado cimarrón. Estos personajes cazaban el ganado, que luego era asado y ahumado (bucan), labor que les valió el epíteto de bucaneros. Más tarde, muchos de ellos se hicieron piratas, aunque continuaron autodesignándose bucaneros, mientras otros siguieron dedicados a la caza y venta de productos ganaderos. "Eran gentes sin rey procedentes de cualquier nación, -señala Lucena- no les amparaba ningún pabellón, ningún gobierno. No eran hugonotes, ni anglicanos, ni calvinistas, ni católicos, y podían serlo todo sin que nadie les dijera nada por ello. Eran malditos rebeldes que vivían en un mundo bárbaro al margen de la civilización...". Fueron propios del Caribe y del segundo cuarto del siglo XVII, período que coincide con el declinar del Imperio español, el cual difícilmente pudo controlar las depredaciones que realizaban en el vasto mundo isleño. What is or is not illegal is for the government of El Salvador to decide. As for your opinion of movies, some movies can be enlightening. Two movies I saw available on the streets were “El Crimen de Padre Amaru”, “Men with Guns”, “Fresa y Chocolate” and “The Magdalene Sisters.” God knows the Salvadorian people desperately need to see these movies. So, if the Government of El Salvador (or any country) says "its legal" then its legal? The German government said that killing the Jews was legal, but the Nuremberg Trials decided otherwise, based upon higher law. The defendants were found guilty and executed. Oh, by the way, I can not even imagine a movie that anyone "desperately needs to see.” However, Old Yeller did make me cry. Thanks again for the dialog. i live in san miguel and see these people everyday selling bootleg dvds taped in a movie theater. people here don't have 15-20 dollars to be spending on a movie so i don't think it's really that big of a deal. we all need entertainment and why not get it cheap. I live in San Salvador, and I also see pirated movies on every block, and I can't even deny I have some at home. The truth is that El Salvador being a third world contry 70% of the population can't afford to waste twenty dollars or more as it has been stated earlier. In fact those who win in this bussiness is not the vendedores but the directors and producers, nothing is given to the government but a "cuartillo". I think that the old saying of blaming it all on goverment is getting old. yeah the vendors are not the ones who are getting rich from this really, is the people behind all this and im afraid to say people who knows sopmething about reproducing i have found movies w/ good quality just like the real one.